Brilliant post, Mike, you tell it like it is, good on you! once again you have sir you have exposed the wrong doing of this government, and why has this man not been held accountable before the only think I can think off is that the powers that be just may be afraid of him. I wonder if he has something on call me Dave .. Then again, all are as bad as each other so sack one , ,, loads would have to also go , ,which would suit me . That’s the plan. Once the resignations start to fall, you know they’re on their way out. thank you for exposing this maniacal manipulating bully. Cameron couldnt get rid of him in a reshuffle so what hope is there of getting this despicable appology of a human being until the next election? Why mess about with IDS the WHOLE lot of them need to be sacked. We employ them we can unemploy them. P45’s all round. P45’s? They get pay when in opposition too. They get booted out of thier seats they get shuffled off as MEP & the House Of Lords..
well said Paul! i totally agree with you! That’s the problem, we can’t, and it’s long past time we should be able to. These people are in government only because we voted them in. We should have a People’s Charter that if they do not stick to what they promised in their election manifesto, we can get rid of them at any time during their term of office. This lot have gone further than any before them (even Maggie). They are selling off our country at an alarming rate to corporate interests – including themselves when they sit on boards and own shares in these same corporations out of which they will make a hefty gain. Assets and services already paid for through our taxes and our parent’s and grandparent’s taxes are being sold off to the highest bidder – and that particular scenario, NOT ONE OF US were apprised of, consulted on or voted for! We need a People’s Charter NOW! – not just with regard to the present government, but ALL future British governments. They need to know going in they will be held accountable to the British people for what they do with our country – OUR country! – we paid for it, we are still paying for it, our ancestors paid for it with their lives fighting and dying for it. For them and for us, we need some mass-event way of letting these greedy bastards know we aren’t going to give all that up without a FIGHT! I agree. But we will mend everything they have torn down. We will heal every injury they have caused. They’re trying to work in against cultural evolution and that will never work; compassion and enlightened though will eventually prevail. And one day all of their efforts will be as nothing. Semi off topic, they want to sign an international treaty that would mean to get an NHS again we’d have to pay all the private companies for lost revenue or leave the World Trade Organisation. The first would be vastly expensive and the second would mess our trade up and be even more expensive. In effect no political party could bring the NHS back, just as the railways can’t be brought back because the tracks have been pulled up and built on. There is an absolute rule that no government can bind any future government. If what you’re saying is true, then a Labour government that wanted to repeal the Health and Social Care Act could just rule that treaty unlawful under UK law, and that would be that, I expect. The alternative would be to say that, fair enough, those contracts are binding and those companies are welcome to them – but we’re going to wind up the NHS as it currently stands and open up an entirely new organisation to provide a national healthcare service in this country, and the government will remove its funding from the old system and put it into the new. Perfectly legal. It’s not quite the same as the railways because the physical wherewithal to provide health services would still be around. So are you saying that we aren’t actually bound under the Lisbon and Maastricht treaties? There should be a vote of no confidence in this pathetic excuse for a coalition,.. I hear all over the net, and on the local radio’s how much people are suffering, I’m one of them too! I have often thought that the Labour Party should have stepped up to the plate before these sick reforms were put through, and feel deserted by the party I support! I have written on several occasions to ask where they stand, and why are they not being more vocal in defending their party members, but have only received a message asking me if I can donate to the party!!!! I have 6 pounds a week to buy food…. how the hell can I donate? My money has been cut as I’m on the WRAG scheme, even though I haven’t registered with them yet as my phone is no longer working, and can no longer leave my home! I am a strong woman but my defenses are weakening and its a real fight to want to continue living/nay existing in a land where human life is worth less than a politicians promise! Ill wager there’s less than a million of us dissafected souls spread nationwide in a country of 64 million, but if those fantasies of rebellion and riots keep you warm at night, you carry on. they for get WHO pay’s there salary’s and other thing’s they ask for, us and not just the “hard working tax payer” at sometime we were all hard working tax payers then this lot came into power and well you can guess the rest. as for Labor before it became new Labor (Tory by any other name) would have ripped into them at every opportunity but the wimp we have now he needs to think about who’s side he is on. What about the rest of them, Cameron and Osborne have lied repeatedly about the deficit! Cameron has said constantly that “they are paying the deficit”! Yet the deficit is rising!!!?? This shows that Cameron is lying about the deficit it is going up now down! The above it Gideon lying about the deficit too! The whole lot of them are lying. Grant Shapps seems to find it really amusing that 5000 people with cancer have been removed from benefits!!?? Have they died? Do they Care??? The worst thing is that they do it with the full support of huge swathes of the public media; the financial sector, the right wing press and the right wing government have carefully structured this entire state of affairs. Remember when we used to be angry with the people who actually perpetrated this global economic catastrophe, rather than the sick, disabled and those in poverty? Smacks of the horrible, stab-in-the-back propaganda that provided a convenient scapegoat for the german nation post-world-war. Find a target to hang your blame on, one that can’t fight back and ignore your own complicity in the downfall of the country in which you live. The British Civil Service used to be overwhelmingly honest even when here today gone tomorrow politicians lied through their teeth. Until now. This is a very bad day for our country. Just signed the petition and emailed it around. IDS is guilty of misconduct in a public office and should be sacked.As should the whole lot of them. And here’s an interesting ATOS story for you, Mike. I emailed this to Glenda Jackson who’s on the Work and Pensions Select Committee. I hereby declare my support for Mike Sivier for the post of Prime Minister? So right, so spot on with the facts and he checks them before he spouts them! I second that proposal! But what would the tired people of the UK think? It must be a trick ‘cos he tells the truth!!!! I wonder how many would recognize it after the last few years of brainwashing by the scumbag coalition? Says pretty much the same as my previous post, but much better. The man is immoral, has no integrity and has no place anywhere near a democracy. Cameron and IDS remind me of “King John” and “Pope Innocent III”…….. Signed & shared on Facebook. Keep up the good work Mike, I just wish there were more people like you fighting our corner! Mike I hope the parliamentary systems you put your faith in will come up with the goods and force the liars to resign but I reckon the most you will get if anything will be an apology. MP’s are not even allowed to call one another liars even if they are. It’s a shame your a labour voter they don’t deserve such an honest supporter. .Ed Milliband’s Labour Party seems more attuned to the unions and his father Ralph was a committed socialist; but he hasn’t been given a chance to prove himself yet. Only being elected will do that. Your decision to vote for UKIP is yours to take but it might be a good idea to learn more about their plans before committing yourself. Personally, I have grave reservations about them. New Labour was one of Maggie’s greatest achievements, God rest her. What is the point of these so called laws and sanctions that the Govt are supposed to abide by if they are not implemented. They just police themselves and that is certainly not ethical. 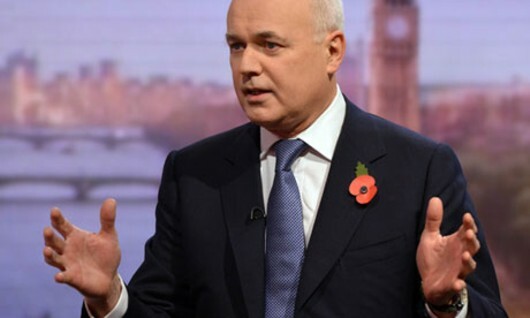 IDS has lied so get rid of him, a slapped wrist won’t change anything. He’ll just continue to lie and cheat hos way through every law known to man. I cannot for the life of me understand why nothing is being done by the other parties about this obnoxious man. Copper wire and a Whitehall lamp-post. That would sort his life out somewhat. This should be front page of every national newspaper and should be the leading story on all news channels, unfortunately all they’re interested in is brainwashing the masses into blaming immigrants and scroungers for the mess we’re in. Other parties have equally obnoxious men in also. What’s your point, exactly? Bear in mind that this article is about Iain Duncan Smith. We are looking at this man’s behaviour. Nobody in the other parties can do what he’s doing to the benefits system, and nobody in the other parties would say what he has said about it. There may very well be equally obnoxious men – and women – in the other parties but please bear in mind that we are discussing the behaviour of a man who has a particular kind of power and is exercising it poorly (at least according to 10,805 of the 10,806 people who have read the article so far, at the time of writing; only one person has attacked the article, and even he did not have anything to say about Smith’s execution of his duties). IDS all dressed up and no brains. Has he started living on £53 a week yet?.Naw thought not! More details on Iain Duncan Smith’s deliberate misleading of Parliament (and public). I’d thoroughly recommend following Mike Sivier’s blog – quality stuff. •	Selflessness – Holders of public office should act solely in terms of the public interest. They should not do so in order to gain financial or other benefits for themselves, their family or their friends. •	Integrity – Holders of public office should not place themselves under any financial or other obligation to outside individuals or organisations that might seek to influence them in the performance of their official duties. •	Objectivity – In carrying out public business, including making public appointments, awarding contracts, or recommending individuals for rewards and benefits, holders of public office should make choices on merit. •	Accountability – Holders of public office are accountable for their decisions and actions to the public and must submit themselves to whatever scrutiny is appropriate to their office. •	Openness – Holders of public office should be as open as possible about all the decisions and actions they take. They should give reasons for their decisions and restrict information only when the wider public interest clearly demands. •	Honesty – Holders of public office have a duty to declare any private interests relating to their public duties and to take steps to resolve any conflicts arising in a way that protects the public interest. •	Leadership – Holders of public office should promote and support these principles by leadership and example. IDS is pushing through populist ideology, based upon bitter, cynical rhetoric to appeal to the no nonsense, dangerously shallow people in society. Its one thing driving change, but change must have a moral integrity at its core. Change based upon lies, propaganda must surely have its day in court. IDS and others who are morally bankrupt, must be accountable for their actions.